Ann Geier, MS, RN, CNOR, CASC, chief nursing officer for Surgical Information Systems, provides tips on ASC management and succession planning in two articles recently published by the Association of periOperative Registered Nurses (AORN). The following article features insight from Ambulatory Surgery Center Association (ASCA) regulatory and government affairs experts. Add specialties. Purchase capital equipment and start performing new procedures. Expand the existing physical space and build additional operating rooms. While ASCs have long asked patients to complete surveys following procedures, administrators and staff often paid insufficient attention to the results. Case costing is a critical process for ensuring an ASC remains financially viable and successful. While it can be a lengthy process, there are numerous reasons why any time spent on case costing should be considered time well spent. Congratulations ambulatory surgery centers! The ASC industry won a legislative victory last week when the U.S. House of Representatives on July 24 passed the ASC Payment Transparency Act of 2018 (H.R. 6138). The Ambulatory Surgery Center Association (ASCA) is hard at work lobbying for the interests of ASCs nationwide and coordinating events designed to help raise awareness of the tremendous value surgery centers deliver to their communities. 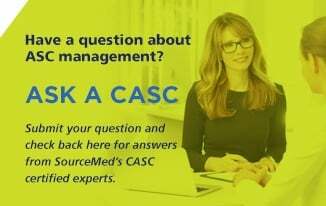 Ask a CASC: How do I Recruit (and Retain) Skilled Surgeons? ASC Case Costing: Where should you start? Who Should Become a CASC and Why? Maintaining your CASC Certification: How and Why?